The sign says it all. Love is never wrong! 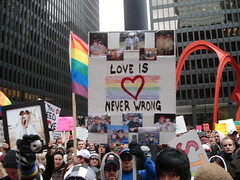 The Protest against Proposition 8 yesterday in Federal Plaza downtown Chicago was AMAZING. It was my first ever protest and it was wonderful to see the turnout of people with signs, flags, banners, chanting, yelling and making a huge amount of noise. There's more to come, but click on the image to see more photos from the Rally. Check back later for the video!